Grammas are found in the family Grammatidae in the order Perciformes. They are sometimes referred to as brasslets, but this can cause confusion since the term brasslet is used for no less than four genera from three different fish families. Fishbase lists 12 different Grammatidae species divided into two genera: gramma and lipogramma. Grammas will rarely exceed 10 cm (4 inches) in length and several species are colourful. This makes them appreciated aquarium fish, especially the species Royal Gramma (Gramma loreto) and Black-Cap Gramma(Gramma melacara). The Royal Gramma was actually one of the first marine fish species to be commercially bred in aquariums. 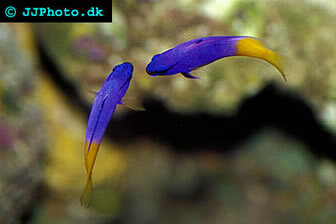 The Royal Gramma is bright yellow on the back half of its body while the front half is purple. The Black-Cap Gramma has a purple body with a frosty-white forked tail. It derives its name from the jet black diagonal cap on its head. In the aquarium trade, you will typically find the species that are colourful and can be collected in shallow waters. Virtually all members of the family Grammatidae can be kept in aquariums without too much ado, but the ones living deep down in the ocean are more expensive to catch and therefore less common in the hobby. Those living further down also tend to be less flamboyantly coloured. One of the benefits of having grammas in the saltwater aquarium is that they will function as “canaries”. If the colours of these fishes begin to look paler than usual, it is a sign of poor water quality. If you act fast you will probably have time to remedy the situation before fish starts to fall ill or die. Grammas prefer to stay close to the reef in the wild and should be provided with a similar environment in the aquarium. They should always be kept in covered aquariums because they are strong jumpers. Grammas live in tropical parts of the western Atlantic from Venezuela to Bahamas. They are only found in saltwater, never in freshwater or brackish environments. The two most commonly kept species, Royal Gramma (Gramma loreto) and Black-Cap Gramma(Gramma melacara), both live next to steep reef fronts, so called “walls”. This is also the typical habitat for the other members of the genus Gramma. At the top of the wall, you can find Royal Gramma from the surface down to a depth of roughly 60-80 feet (18-24 meters). If you go deeper, you will encounter the Black-Cap Gramma who inhabits the wall down to roughly 120-160 feet (37-49 meters). Below this depth you will find the home of the Yellowlined gramma (Gramma linki). The members of the genus Lipogramma are deep water fishes, and since they also tend to be less colourful than shallow-dwelling Gramma species they are not commonly found in the aquarium trade. Grammas are not very tricky to feed in captivity and are for instance known to appricate shrimps, especially when served live. With a little training you can coax them into accepting most food types. It is important to keep your Grammas on a varied and well balanced diet.